This past weekend, I attended four Veterans Day events throughout the 48th Legislative District to help honor our veterans. 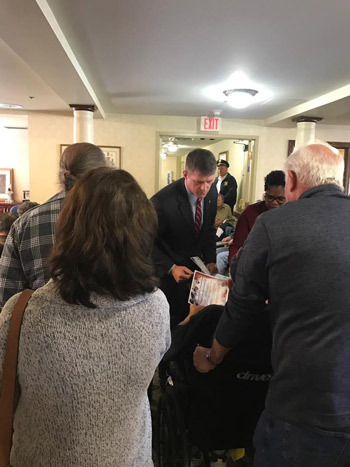 The events included ceremonies at the Washington Farmers Market Pavilion, North Strabane Retirement Village and Cecil Township Senior Center. My family and I also participated in the city of Washington Veterans Day Parade. Thank you to all our veterans for risking their lives to protect our freedoms. With a strong majority going into the 2019-20 legislative session, the 110 members of the House Republican Caucus – including 91 returning legislators and 19 freshmen – elected their leadership team to begin Jan. 1. This is just the second time since 1924 that Republicans have maintained control of the House for more than four terms in a row. Rep. Mike Turzai (R-Allegheny) has again been nominated to serve as speaker of the House. He will face an official election to the position on swearing-in day on Jan. 1, 2019. Once official, this will be his third term in the oldest position in the Pennsylvania General Assembly. New to their respective leadership positions are House Majority Leader Bryan Cutler (R-Lancaster), Majority Whip Kerry Benninghoff (R-Centre/Mifflin), Majority Policy Committee Chairman Donna Oberlander (R-Clarion/Armstrong/Forest) and Majority Caucus Secretary Michael Reese (R-Westmoreland). Retaining their respective leadership positions are Appropriations Chairman Stan Saylor (R-York), Caucus Chairman Marcy Toepel (R-Montgomery) and Caucus Administrator Kurt Masser (R-Columbia/Montour/Northumberland). In honor of the Thanksgiving holiday on Nov. 22, state offices will be closed on Thursday, and my offices will also be closed on Friday, Nov. 23. PennDOT Driver License Centers will also be closed Nov. 22-23. If you are traveling, be sure to check 511pa.com for the latest traffic and weather information. To find a list of local processors or for more information, visit ShareDeer.org. The Center for Rural Pennsylvania and its research partners at Penn State University are continuing to invite Pennsylvania residents to help provide that much-needed information by taking the broadband speed test available here. Your participation will help map broadband access in Pennsylvania, providing a valuable tool as lawmakers work to resolve this issue.